Re Released in 2011 on the eShop and DSiWare. 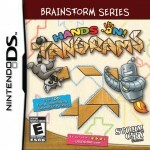 Released originally in 2009 for the Nintendo DS, Hands On! Tangrams is a puzzle game aimed at the youth and causal markets. Based on the 18th century Chinese moving tile game, Hands On! Tangrams allows gamers to manipulate geometric shapes to mimic real-life objects.